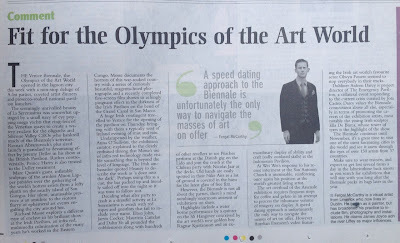 The Irish Examiner asked to me to write about the opening of The Venice Biennale in early June. 'The Venice Biennale, the Olympics of the Art World opened in the lagoon city this week with a non stop deluge of A-list parties, coveted artist dinners and prosecco-soaked national pavilion launches. The seemingly unrivalled beauty of La Serenissima was somewhat upstaged by a small navy of eye popping mega yachts that ring-fenced the Venetian quays to create a watery enclave for the oligarchs and Silicone Valley CEOs who bankroll much of the Biennale's activities. Roman Abramovich's plus sized launch is parodied to devastating effect by Jeremy Deller in his show at the British Pavilion. Rather controversially Prince Harry is also treated to the Deller treatment. Marc Quinn's giant, inflatable sculpture of the armless Alison Lapper presides over the gathering of the world's hottest artists from a lofty plinth on the nearby island of San Giorgio. Her silent, unmissable presence is an antidote to the riotous flurry of ephemeral art events engulfing the city around her. Richard Mosse explores a different type of enclave in his startlingly brilliant show at the Irish Pavilion, an infra red, multi media culmination of the many years the photographer has worked in the Eastern Congo. Mosse documents the horrors of this war soaked country with a series of curiously beautiful, magenta hued photographs and a recently completed five screen film shown to achingly poignant effect in the darkness of the Irish Pavilion on the bend of the Grand Canal in San Marco. A huge Irish contingent travelled to Venice for the opening of the pavilion on Thursday bringing with them a typically west of Ireland evening of mist and rain. Undampened by the weather Anna O'Sullivan, the exhibition curator, explained to the clearly enthused throng that Mosse's use of infra red technology made visible something that is beyond the level of language. The Irish ambassador quoted Heaney to describe the work as 'a door into the dark'. Perhaps using this as a cue the bar packed up and literally sailed off into the night so it was time to follow suit. Deciding what after party to crash is a stressful activity as La Serenissima is awash with red ropes and guestlists that fail to include your name. Elton John, Jarvis Cocker, Maurizio Cattelan and Dahn Vo all pounded the cobblestones along with hundreds of other revellers to see Peaches perform at the Danish gig on the Lido and join the crush at the Chilean party with Nicolas Jaar at the decks. Old hands at Biennale party hopping are easily spotted in their Nike Airs as a lot of ground is covered in the hunt for the latest glass of free fizz. However the Biennale is not all about the parties, there's also a mind numbingly enormous amount of exhibitions on show mostly centred at the Arsenale, a giant warehouse formerly the home of the city's navy and at the Giardini which houses many of the national pavilions designed by the who’s who of old school starchitects including Alvar Alto for Finland (of course!) and Carlo Scarpa. Highlights of this year’s mine of art wonders include a beautifully moving, water borne performance by a quintet of brass players on the SS Hangover conceived by the art world’s new golden boy Ragnar Kjartansson and an extraordinary display of ability and craft (sadly outdated skills) at the Indonesian Pavilion. Ai Wei Wei’s response to his recent internment at the San’Antonin Church is simply unmissable reinforcing once again his position as perhaps the greatest artist in the world at the moment. The art overload of the Arsenale exhibition requires frequent stops for coffee and gelato in an attempt to process the inhumane volume of imagery on display. 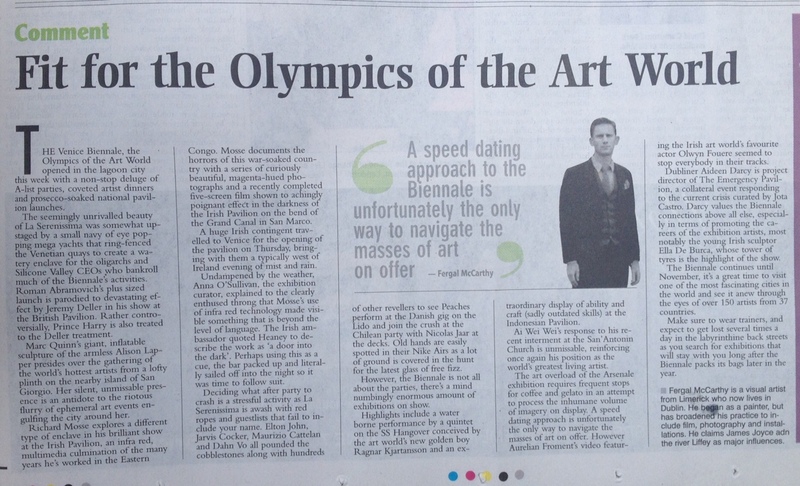 A speed dating approach is unfortunately the only way to navigate the masses of art on offer. However Aurelian Froment’s video featuring the Irish art world’s favourite actor Olwyn Fouere seemed to stop every body in their tracks. Stumbling home through St Mark’s Square at two in the morning I was pleased to bump into Froment and his partner Tessa Giblin (director of the gallery at The Project Arts Centre in Dublin) and gush admiringly about his film. 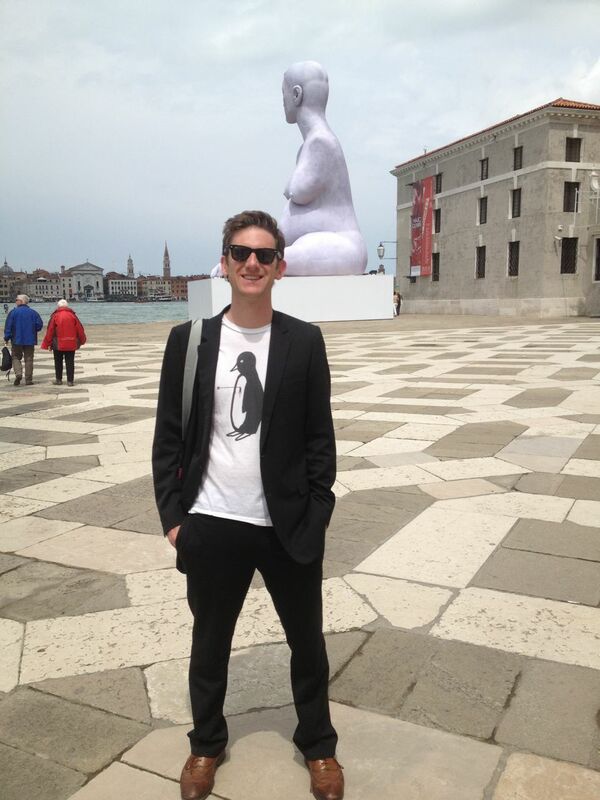 The opportunity to bump into people you know or want to know is perhaps one of the best perks of the Biennale. Walking through the backstreets, especially at night is like witnessing the magazine ArtForum come to life. Artists, dealers and curators come here to make invaluable, real life connections in a business that increasingly operates online. For a few days at least the internet ceases to dominate art proceedings. Dubliner Aideen Darcy is the project director of The Emergency Pavilion, a collateral event responding to the current crisis curated by Jota Castro. The exhibition which overlooks the san Michele cemetery features several artists last seen at Dublin Contemporary in 2011, an exhibition also curated by Castro. Darcy values these Biennale connections above all else, especially in terms of promoting the careers of the exhibition artists most notably the young Irish sculptor Ella De Burca whose tower of rubber tyres is the highlight of the show. The Biennale continues until November, it’s a great time to visit one of the most fascinating cities in the world and see it anew through the eyes of over 150 artists from 37 countries. Make sure to wear trainers, expect to get lost several times a day in the labyrinthine back streets as you search for exhibitions that will stay with you long after the Biennale packs its bags later in the year'.